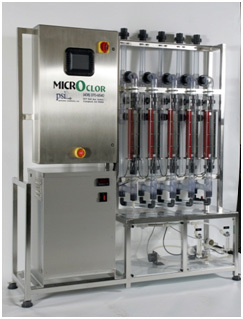 Process Solutions Inc. MicrOclor OSHG system is a third generation system resulting from over twenty years of research, development, and installation experience. OSHG is a safe, economical alternative to other disinfectants used in water and wastewater. 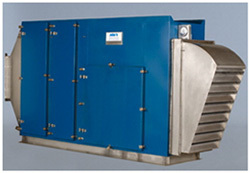 The Aries® Managed Air System is a revolutionary filter air scour system. The Aries is the preferred method of auxiliary wash for the cleansing of a filter, since it provides thorough cleansing of the entire filter bed versus surface wash systems or passive air systems which are only effective in the top layer of the filter bed. The FloatSep design takes advantage of complex hydrodynamics to consistently capture floating solids. Lower cost of ownership, simplified operation and maintenance make the Versacomb Matrix a better solution than traditional pellet odor control systems. The Invent HyperClassic Mixer is a vertical shaft mixer with a hyperboloid shaped mixer body installed close to the bottom and a dry mounted drive. In contrast to other products, it was developed and designed especially for applications in the area of water and wastewater treatment. 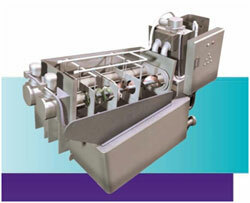 The PWTech volute dewatering press is a unique product, originally developed in Japan that offers many advantages over current sludge management practices. Sludge is fed into a mixing tank where polymer is thoroughly mixed in. The sludge then passes through a flocculation tank where gentle mixing and flocculation occurs. From there, the sludge overflows into the dewatering drum and is pressed. 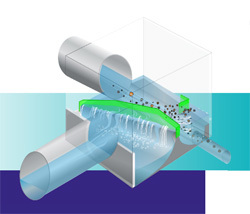 The entire operation is controlled by the volute dewatering press control panel. 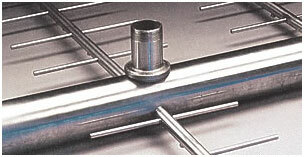 The Tower Press is truly the number one belt filter press for municipal and industrial applications. High cake solids, improved capture rates, greater through-put, along with long lasting performance, add up to greater efficiency and a lower overall cost of operation. Oxidation ditches are reliable, have the ability to handle high peak flows, and with the proper configuration offer biological nutrient removal. These key factors have made them one of the most popular secondary processes in the wastewater treatment industry. Introduced in 2008, Smart conveying technology reduces maintenance, pump down time, foot print, and life cycle costs by utilizing a split stator and detachable rotor.